Pacific Delight Tours (www.PacificDelightTours.com) knew it was tapping into a rapidly growing market with significant pent-up demand when the leading operator launched a new gluten-free tour series earlier this year. Executives at Pacific Delight did not anticipate how quickly the company’s May 2017 China tour would sell out and are now working to add additional capacity, beginning with a Gluten-Free China & Yangtze River departure on Oct. 7, 2017. 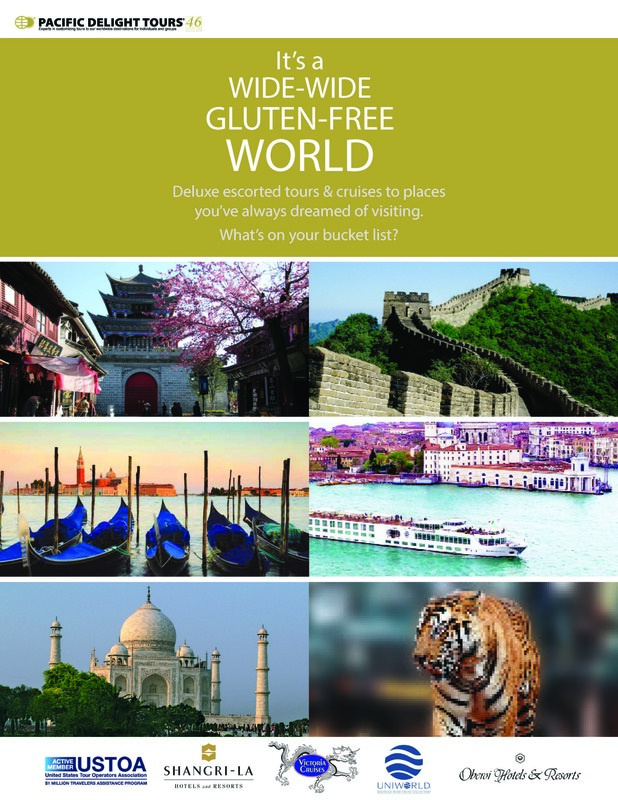 Pacific Delight will also debut a Gluten-Free Italy program on Oct. 15, 2017—featuring a deluxe river cruise on the picturesque Po River in cooperation with Europe’s river cruise leader, Uniworld—and will return to India’s Golden Circle with a departure on Dec. 5, 2017. 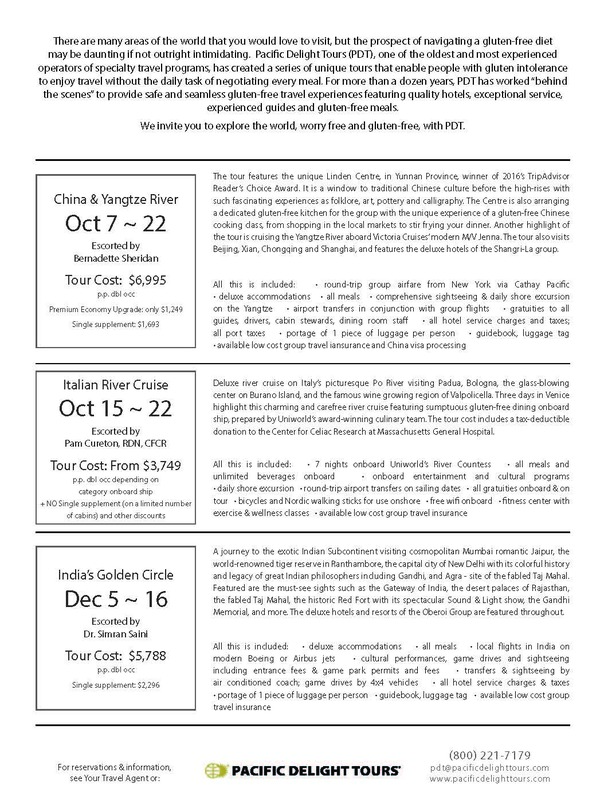 Pacific Delight’s Oct. 7 China & Yangtze River departure—escorted by gluten-free food and China travel guru Bernadette Sheridan—will feature unique sightseeing and activities such as a gluten-free Chinese cooking class at the Linden Centre in Dali, winner of the 2016 TripAdvisor Reader’s Choice Award. The tour will incorporate a luxury river sailing aboard Victoria Cruises’ five-star Victoria Jenna in addition to fascinating experiences in Beijing, Xi’an, Chongqing and Shanghai. Luxurious hotels of the Shangri-La Group will be featured for the program. The departure is priced at $6,995 per person, based on double occupancy, incl. all taxes and gratuities, and includes round-trip airfare from NYC via Cathay Pacific Airways. 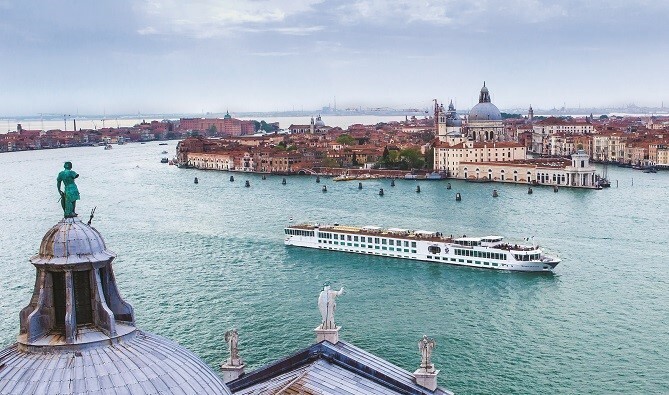 The Oct. 15 departure for Pacific Delight’s new gluten-free Italy features Uniworld’s recently remodeled, 130-passenger River Countess for a deluxe river cruise along Italy’s Po River, visiting Padua, Bologna, Murano Island and three days in Venice. Guests enjoy sumptuous gluten-free dining on board prepared by Uniworld’s award-winning culinary team. Guests will also receive unlimited beverages, all gratuities, complimentary Wi-Fi, on-board entertainment and lectures, shore excursions and airport transfers on sailing days. The single supplement will be waived for a limited number of cabins, and all passengers will receive a $100 shipboard credit. Past Uniworld travelers will also enjoy additional savings. For reservations received by April 30th, Pacific Delight is also offering an extended introductory discount of $400 per person. The program will be led by respected dietitian Pam Cureton, RDN, of the Center for Celiac Research (CFCR) at Massachusetts General Hospital. 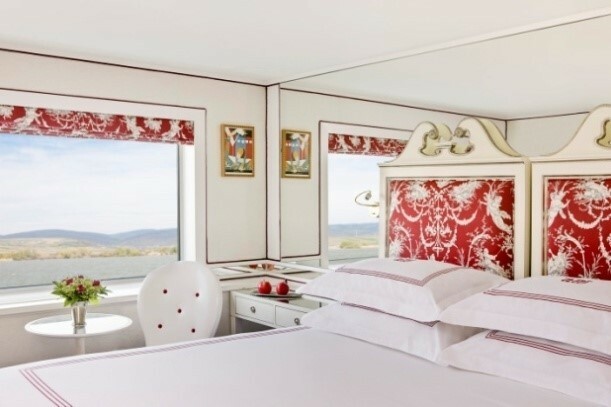 Italy rates start at $3,749 per person, based on double occupancy (reduced to $3,349 per person when booked by April 30th), and vary based on stateroom category selected. The tour cost includes a tax-deductible donation to CFCR. International airfare is not included. 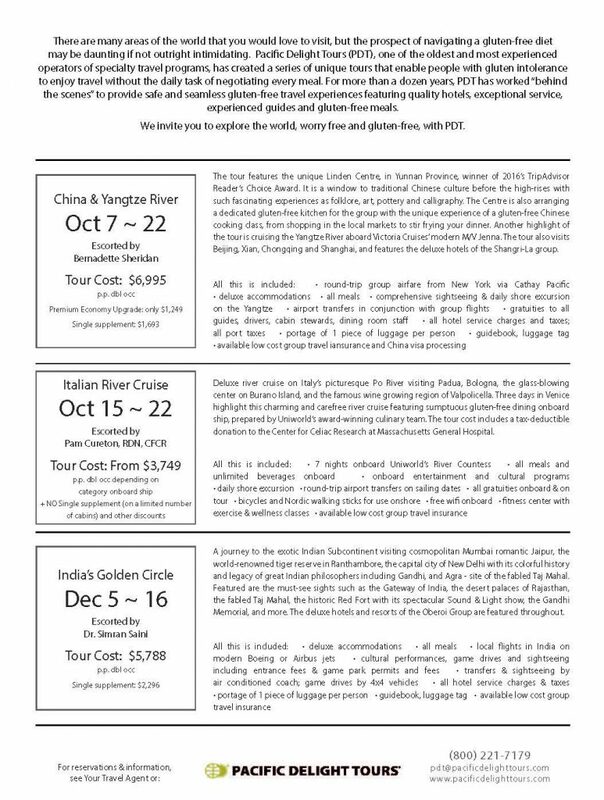 Pacific Delight is also accepting bookings for its second gluten-free tour of India’s Golden Circle, visiting cosmopolitan Mumbai, romantic Jaipur, the exotic tiger reserve in Ranthambore, colorful New Delhi and must-see Agra—home of the Taj Mahal and other UNESCO World Heritage Sites. Deluxe hotels and resorts of the Oberoi Group will be feature in the program, which will be escorted by Dr. Simran Saini (pictured right), chief dietitian of India’s foremost celiac support organization. She is a registered nutritional therapist in Ireland and England, and affiliated with India’s Fortis Group of Hospitals. The tour is priced at $5,788 per person, double occupancy, and includes local intra-India flights, sightseeing by air-conditioned coach and 4×4 vehicles for game drives, and all taxes and gratuities. International airfare is not included. “We are excited to introduce a world of gluten-free travel opportunities and are actively working to accommodate the growing demand for gluten-free experiences,” said Charmaine Lau, operations manager of Pacific Delight Tours. Consult your travel agent or contact Pacific Delight Tours at 800-221-7179 for more information. Visit Pacific Delight Tours at www.PacificDelightTours.com. 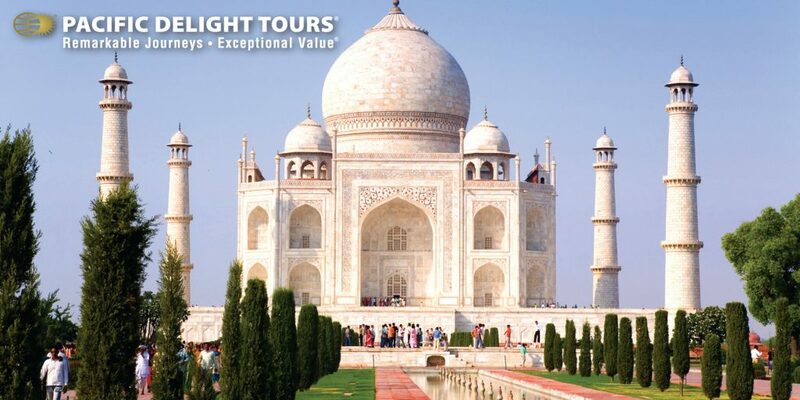 For 46 years, Pacific Delight Tours has been America’s leading tour operator to China and Asia. Among numerous industry awards, the luxury tour operator is a proud winner of the TravelAge West WAVE Award from 2008–2016, the 2009 Travel Weekly Readers’ Choice Award, and the Travvy Award from travAlliancemedia for Best Vacation Packager, Asia for 2016 and 2017. The company is also a proud member of the United States Tour Operators Association (USTOA).